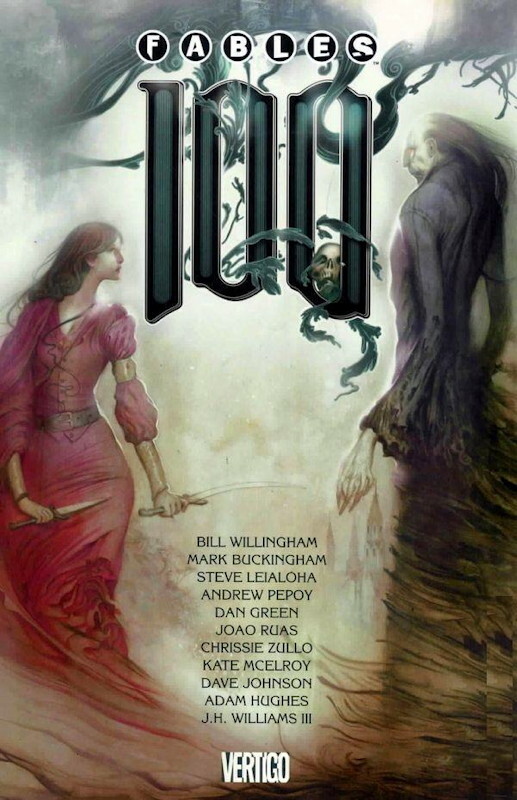 Fables reaches the big one-zero-zero this month – quite a milestone for a comic that features no superheroes at all. I’ve been on board since the beginning, and while it’s had its ups and downs, it’s been quite a fun ride. Since the war against The Adversary wrapped up in #75, the book has taken an even darker turn (and considering the book’s first story arc was entitled “Legends in Exile”, that’s saying something): A powerful entity named Mister Dark (whom some compare to Neil Gaiman’s character Morpheus, but I think the similarity is superficial at best) destroyed Fabletown, forcing the surviving fables to flee to The Farm in upstate New York. Mister Dark has been building his own edifice atop the remains of Fabletown, but finally someone has dared to challenge him: Frau Totenkinder, having been reborn as a young woman and calling herself Bellflower, engages him in a duel to the death of one of them in this issue. The Mister Dark storyline has had some gripping moments, but overall the series has felt somewhat adrift, much like the Fables themselves. The most recent story arc highlighted the backstory of Rose Red, and her getting her act together to be a leader on the Farm again. But since Bellflower is the one who actually brings the fight to Mister Dark, that arc now feels a little superfluous. Fables has always tended to take a circuitous route to the end of its stories, but whether they end up being fun has depended more on the characters involved than anything else; Bigby Wolf, Snow White and Boy Blue carried the first 75 issues, but the recent focus on Rose Red and the witches has been a lot less successful, as none of them have really been sympathetic characters. More to the point, they’re all fairly inwardly-turned characters, so their interactions with the other Fables tend to be not very entertaining. The conclusion of this issue is disappointing since it’s more of a transition than an end to the Mister Dark story, and I was really ready for his story to be over. The big fight in the issue is quite well done, but I’d been hoping for a different outcome. The issue contains lots of extras – short stories, even paper doll cut-outs – which feels like an anniversary issue or giant-sized “annual” of years past. Certainly a nice package. I’d just been hoping for more out of the main story. I don’t think I’ve ever bought anything rom Aspen Comics before – they seem to largely specialize in ladies-in-skimpy-costumes fare with run-of-the-mill stories. But Joe Benitez’ new steampunk series Lady Mechanika interested me. (That cover on the left, by the way, is by J. Scott Campbell, and is awful. The main cover, which you can see here is much better. But the Campbell cover is the only one my retailer still had in stock when I was there.) Certainly steampunk doesn’t have a shortage of improbably-skin-baring Victorian ladieswear, and Lady Mechanika‘s interiors seem right in keeping with the genre as I’ve seen it otherwise. The story is okay: Lady Mechanika is an almost-legendary vigilante in the English city of Mechanika, a woman who’s left-machine, but whose role in the city’s life seems vague (is she a protector or avenger like Batman, or just someone investigating other unusual creatures like herself?). In this issue she’s looking into a report of another woman who’s turned up in the city with mechanical limbs, who promptly died after her arrival. The story and art are long on atmosphere, but short on plot advancement or characterization. It’s not bad, by any means, but it’s lightweight. I’m not familiar with Joe Benitez’ work, but he’s a pretty good artist, definitely a cut above the typical Image-style artist. The book has some promise, but it’s also at great risk of being an ordinary steampunk adventure. Time will tell which direction it heads. 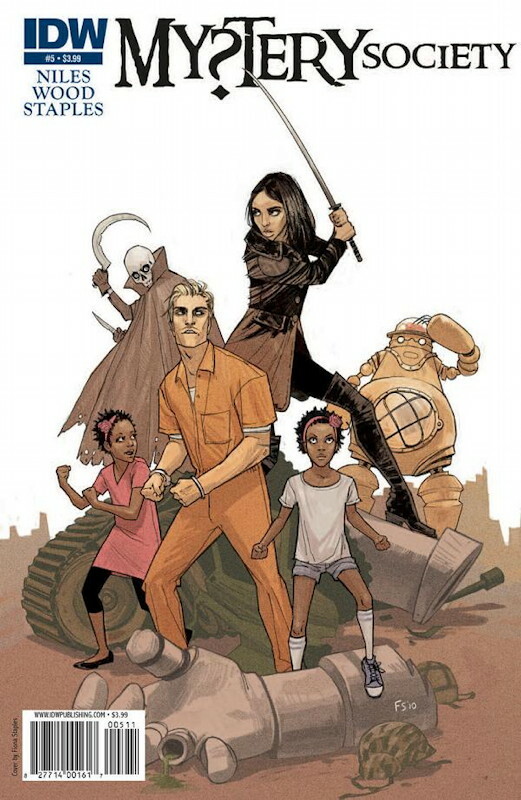 Steve Niles’ The Mystery Society wraps up this month. As a new entry in the monster-hunter adventure genre (alongside Hellboy and The Perhapanauts), it holds up quite well, with a strong dose of The Thin Man-inspired marital intrigue between Nick and Anastasia Mystery, with several peculiar characters joining them in their quest to investigate strange occurrences and liberate mysterious objects from around the world. It’s not going to set the world on fire, but it’s fun and funny. The best part, I think, has been watching artist Fiona Staples develop, expanding her range of expressions and poses. Her biggest drawback as an artist is that her backgrounds tend to be sketchy-to-nonexistent, which makes the book feel like it’s taking place in a multicolored mist at times. Hopefully she’ll flesh out that part of her skill set on her next project. I don’t know that The Mystery Society has a huge amount of long-term potential, but I’d read another series about these characters. Whether I’d go beyond that depends on whether Niles has some solid character surprises up his sleeve.